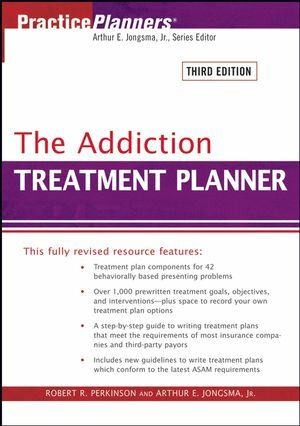 The Addiction Treatment Planner, Third Edition provides all the elements necessary to quickly and easily develop formal treatment plans that satisfy the demands of HMOs, managed care companies, third-party payors, and state and federal review agencies. ARTHUR E. JONGSMA, Jr., PhD, is Series Editor for the bestselling PracticePlanners®. Since 1971, he has provided professional mental health services to both inpatient and outpatient clients. He managed a group private practice for twenty-five years and is now a staff member at Life Guidance Services in Grand Rapids, Michigan. ROBERT R. PERKINSON, PhD, resides in Canton, South Dakota. He is Clinical Director of the Keystone Treatment Center in South Dakota and author of Treating Alcoholism: Helping Your Clients Find the Road to Recovery (Wiley). Contents Listed by ASAM Assessment Dimensions. Adult-Child-of-an-Alcoholic (ACOA) Traits (Dimension 3). Attention-Deficit/Hyperactivity Disorder (ADHD; Dimension 3). Attention-Deficit/Inattentive Disorder (ADD; Dimension 3). Living Environment Deficiency (Dimension 3). Oppositional Defiant Behavior (Dimension 3). Parent-Child Relational Problem (Dimension 6). Partner Relational Conflicts (Dimension 6). Peer Group Negativity (Dimension 6). Posttraumatic Stress Disorder (PTSD; Dimension 3). Social Anxiety/Skills Deficit (Dimension 3). Appendix B. Index of DSM-IV-TR Codes Associated with presenting Problems. Appendix C. Client Satisfaction Surveys: Resource Material. Appendix D. ASAM Six Assessment Dimensions: A Checklist Example. New interventions that enable practitioners to track patient outcomes, by indicating when to re-test or re-assess using recognized assessment tools. Additional new interventions aimed at measuring patient satisfaction and perception of quality of care, as required by accrediting agencies. Intervention language that follows the mandates of the American Society of Addiction Medicine (ASAM) which are being adopted at the state level across the US. Flexible format which allows practitioners to choose easily between newer evidence based and traditional "best-practices" treatment approaches.